If you are preparing for a Fantasy Hockey League, your Office Pool, or paying attention to your favourite team, you should be aware of some injury woes being felt throughout the league at present. While Andrei Markov was injured some time ago, recent additions to the list include New York Islanders' D Mark Streit, and F Kyle Okposo, as well as the ongoing saga of Marc Savard in Boston. Here is a breakdown of some of the key injuries across the league that may have an impact on your pool / draft in the days to come. 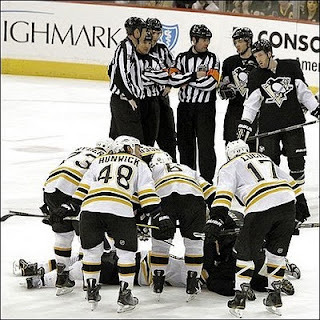 Boston Bruins – Marco Sturm – 2 months, Marc Savard – out indefinitely. Calgary Flames – Daymond Langkow - out indefinitely, Matt Stajan – out indefinitely. Vancouver Canucks – Alexandre Burrows – Out 1-2 months, Sami Salo - out indefinitely (at least December). You might as well hard code Salo's name on the injured list!! !